Thai Sweet Chili Chicken - amazing and best-ever chicken recipe with sticky, savory and sweet chili sauce. This Thai chicken recipe is so good you will want to lick the plate! I love Thai recipes and I am addicted to Thai sweet chili sauce…the sticky sweet, gooey, with a tint of heat orange-color sauce that goes so well on everything! I love it so much that I serve almost all my appetizers with the sauce, for example: fried chicken wontons, Thai lettuce wraps, Thai shrimp cake, etc. I developed this sweet chili chicken recipe because I wanted sweet chili sauce on my main dish. My recipe is so easy. Take some chicken, cut into pieces, battered, deep-fried and then toss and stir fry in the wok or skillet with some garlic, sweet chili sauce and lime juice. 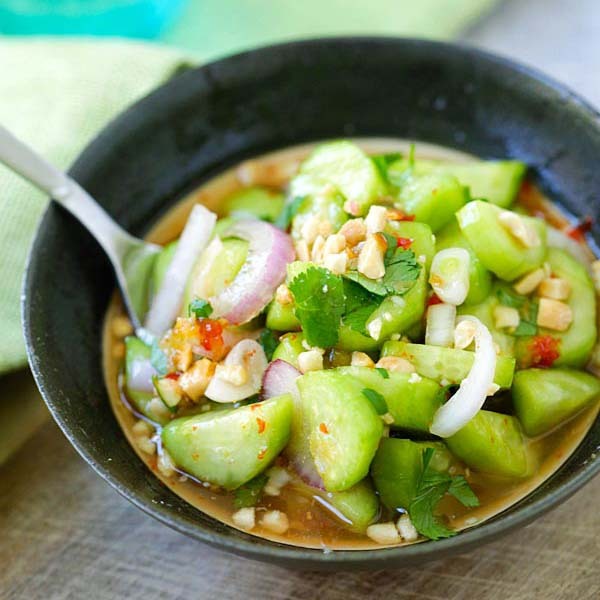 To serve, garnish and top with sesame seeds and chopped cilantro and you have a quick, easy, and delicious dish. This recipe is picky eater friendly, as my son actually asked to try this dish. He ate so many pieces of the chicken without even realizing that he was eating spicy chilies! This meal is best served with steamed rice. 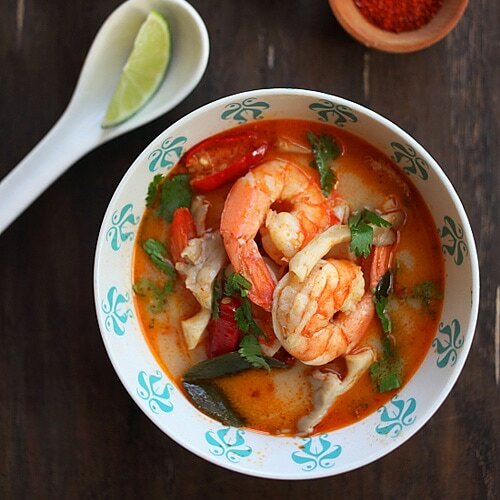 For a wholesome Thai meal and easy weeknight dinner, I recommend the following recipes. Add this sweet chili chicken to your daily menu if you love Asian food. It’s utterly delicious, appetizing, and SO good. Try this recipe and I am very sure you will thank me! Thai Sweet Chili Chicken – amazing and best-ever chicken recipe with sticky, sweet and savory sweet chili sauce. SO good you will want to lick the plate!! Mix all the ingredients for the Batter until well combine. Add the chicken into the batter. Heat up a wok/skillet with about two inches of oil. As soon as the oil is fully heated, deep-fry the chicken until golden brown. Transfer the chicken out to a dish lined with paper towels to sock up the excess oil. Clean the wok/skillet and heat it up on medium heat. Add the oil and stir-fry the garlic until aromatic. Transfer the fried chicken into the wok, follow by the sweet chili sauce, lime juice and salt. Stir to coat the chicken well with the sweet chili sauce. Dish out, garnish with the white sesame and cilantro leave. Serve immediately. You can buy Thai sweet chili sauce from regular supermarket in the Asian food aisle, or any Asian food stores. Ive made this recipe today and it’s off the charts! So good. I used more of the chili sauce than the recipe called for. It was still delicious without extra sweet chili sauce. I put it over “success” white rice. Perfect together. Hi Marlene, thanks for trying my Thai sweet chili chicken recipe. Please try out more of my recipes!! 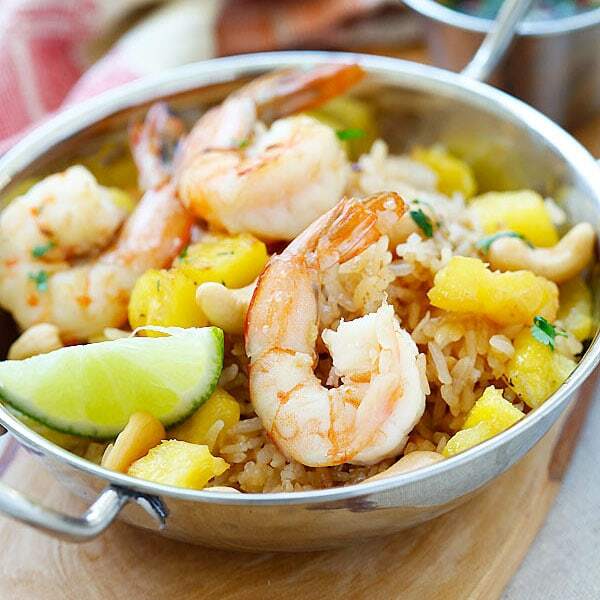 Shrimp is a great option, I will have to make it soon!! I want to try this so badly, but I can’t eat anything that is not organic! ( Doctor’s Order’s! I’m trying to beat a 17 year illness!) Do you have a recipe for the sweet chili sauce? I can usually find organic ingredients or substitutes for almost any recipe, or at least I’ve been lucky so far! This sounds so wonderful! I can imagine it with shrimp also! Thank you for the recipe, I’ll figure something out one way or another! Yes you can make sweet chili sauce from scratch. Maybe I will share the recipe one of these days! Place all ingredients – except the cornstarch-water mixture – in a sauce pan or pot. Reduce heat to medium and let boil for 10 minutes, or until reduced by half. Reduce heat to low and add the cornstarch-water mixture. Stir to incorporate and continue stirring occasionally until the sauce thickens (about 2 minutes). Remove from heat and taste-test. You should taste “sweet” first, followed by sour, then spicy and salty notes. If the sauce isn’t sweet enough, add a little more sugar. If not spicy enough, add more chili. Pour sauce into a small bowl or jar and serve as a condiment with chicken, fish, and seafood, or as a dip with finger foods such as chicken wings, shrimp, or spring rolls. Also makes an excellent marinade for grilled chicken, fish, or seafood. Thank you! My grocery store doesn’t carry it! I would LOVE to get the chicken RIGHT for this…the crispiness has eluded me and no matter what recipe I try it doesn’t work…. Who needs to go out for dinner when they can make this at home? These look flavorful and delicious. I can’t wait to try this in my own kitchen. This Thai Chili chicken looks so good. We’re trying to eat healthier these days, eat more chicken less red meat but it gets tough when you get into a rut. This looks (and I mean this as the best compliment I can pay) like a dish I’d order at the Mall food court and be a happy man. Yum and more yum. Thanks Tom, yes, this Thai sweet chili chicken is awesome! Quick question for you. I’ve never had this issue before but when I use this batter recipe, the oil spatters in huge drops out of the pan. Thankfully I had a lid or i would’ve had a fire on my hands. Am I doing something wrong?? Thanks! I am not sure what happened I never have that problem. Your oil probably has water in it. Your oil is way too hot. Thank for the easy, healthy recipe. I am going to try it now. My 7 year old daughter and I made this tonight! OMG…..so delicious! Will definitely make this often. Thanks for the great recipe! i never review- but must admit- I do read many. this recipe was SO ridiculous. I doubled the recipe for my family of 5. I also added double the lime to the pre-made bottle sauce I had- other than that- I followed the recipe. My husband asked me if I’d gotten takeout from P.F. Chang’s ( ;) ). The batter is what it is all about- (I fried it off in my mini deep fryer then tossed in sauce) so crispy! the batter I’ll use forever- THANK YOU! Do you think this recipe would work using gluten-free flour to batter the chicken? It looks amazing, but unfortunately gluten isn’t an option. You can try I am not familiar with GF flour. wow, I’ve tried a bunch of your recipes (have the e-book) and now have to add this one to the rotation as well!! How simple it is blows my mind and really the batter is just awesome. I have loved this sauce and have used it as dips before but never thought to use it like this. AMAZING!! YUM! Hi Anna, thanks so much for being a fan and thanks for buying the cookbook. You will be an amazing cook for Asian food in no time!! Thanks for this great recipe! I made a variation of it to make it a tad healthier. I mentioned it on my blog today because I enjoyed it so much. Check it out if you get a minute. Thanks for the recipe inspiration! Can I replace the all-purpose flour with plain flour? Hi Bee, thanks for this recipe. I like it and easy to make. I used the leftover frying batter to fry onion so had also onion ring for addition :). Excellent idea for using extra batter, I’m doing it next time, thank you. This is the best sweet chilli chicken recipe I’ve ever tried! I have a question, though: can I keep the frying batter in the fridge overnight? I had a lot of it leftover (I made less chicken, and I do regret) and I was wondering if I could use it tomorrow with other sauce (i’m thinking maybe teriaki). Glad that you tried my sweet chili chicken. If you want it spicier, you can always add some cayenne pepper to the chicken. Will adding cold water to the frying batter make it splatter when frying? Hi Can I use any other sweet chili sauce? Would it make a difference to the flavour? You can use another brand of sweet chili sauce but the taste may not be entirely the same. I have a really silly question! When you put the chicken pieces into the batter, should the chicken already be fully cooked? Or, does it cook while it’s frying? The chicken is raw, you cook the chicken while frying. Instead of regular flour could I use coconut flour? I am not familiar with coconut flour so I am not sure. Hi. Can you serve it with jasmine rice? I made this yesterday for lunch, it was DA BOMB!! so delicious!! I am definitely going to make this often. thank you! Hi Anes, thanks for trying my recipe, I am so glad you liked the Thai Sweet Chili Chicken. Hi Bee. Do you know if I can to freze it? I am not an adventurous cooker, very much meat and potatoes, but this sauce issoooo good, and I was lucky to find it in my grocery store. Love it. Hi Donna, awesome, I am so glad you liked my sweet chili chicken recipe. I tried to replicate this recipe and it turned out to be an utter complete disaster! Sorry, most likely my fault, but the batter was not proportionate to the chicken and it was so tasteless! My partner threw it away after trying the first few bites and we were disappointed. Any advice? Hi Dino, that sounds strange. This Thai sweet chili chicken recipe is very good. The batter works for all my recipes and produces crispy chicken like my photos. Cup as in US measuring cup. Made this tonight. Anyone who is concerned about gluten can easily substitute sweet rice flour for the regular flour with excellent results. This was delicious and completely addicting. I love your recipes. Thanks for sharing so much goodness! Hi Paula, thanks for trying my recipes. I am glad that you love them. Hey Sarah, that’s awesome. So happy that you love my recipe! I made this tonight and I absolutely loved it! I have to agree with others that the batter recipe is spot on…just like take-out! Thanks Doris, I am so glad that you liked my Thai sweet chili chicken recipe. Tried this last night as I am a huge fan of Thai sweet chili sauce … the recipe turned out FANTASTIC. It was seriously restaurant quality. I may make it again tonight! :) Quick question: do you think this would work with shrimp or cut-up pork? I would love to use that yummy batter on other things! Thanks! Awesome thanks for your sweet comment! Yes, shrimp pork fish are all fine. I tried. It was delicious. I am sharing with my friends and family. Thanks a ton for the recipe. Easy and tasty. Hi Puja thanks so much for trying my Thai sweet chili chicken recipe. Hi Bee. Thank you for such a delicious easy chicken recipe. Never have to buy takeways again. The batter is awesome. Im going to try it with a touch of ginger. This looks delicate but I have no idea what the batter for this chicken. Can you tell me what to add in chicken before deep frying it? I would love to try this at home but just waiting for the details from you? Click on the red bar at the bottom: CLICK HERE FOR RECIPE. I have an aerogarden with a ton of thai basil. Can I substitute the cilantro with thai basil? I read this recipe tonight and have not tried it yet but I have made homemade fried chicken before and then brushed on the sweet chili sauce and put it in the oven on low and was a big hit in my home. Served with white rice and steamed broccoli. The sweet chili sauce caramelized like that is great. Hi Tara, that’s great that you love this sweet chili chicken. I give up, what is the 1/2 cup of cold water for??? Question, could I make this without frying it and How? Would I just cook the chicken and then pour the sauce on the chicken? Your amazing for replying so fast! Thank you ? Is this mean extremely spicy? I love spicy food, but my husband, not so much! No, it’s not spicy at all. Just very mild. The batter calls for oil. Is that correct? Hi Bee, can we fry up the chicken a day or two in advance and keep them in the fridge/freezer? Would they still be crispy? Thanks! It’s super awesome, my whole family loved it! Where did the recipe go? Its not loading… Can you fix it please??! Brittany – the recipe is at the bottom of the page, please scroll down. Can you put this in prep meal containers and store in the freezer then re – heat? Can you use an egg replacer? I have an egg allergy and would love to make this, but unsure if it would work. You can skip the egg.